Believe it or not, there is a place called Cockroach Bay, and it's one of the most beautiful areas of Tampa Bay! But, like many parts of the bay's shoreline, invasive plants have moved in and are muscling out more beneficial natives. 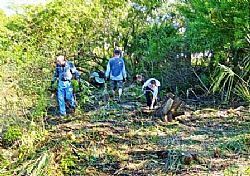 For this workday, we will partner with park staff to remove invasive Brazilian pepper trees, Caesar weed and Balsam apple at the Cockroach Bay Aquatic Preserve in Ruskin. Afterwards, all volunteers will receive lunch and volunteers can enjoy the preserve -- which includes a kayaking trail and hiking paths -- for the rest of the afternoon! Lightweight long pants, long-sleeved shirts and sturdy shoes such as old sneakers are highly recommended. Sandals, flip flops or other open-tied shoes are a definite no-no. When: Saturday, Nov. 14 8:30 -1 p.m.